I am delighted to make my first contribution to "Birding Is Fun!" - because birding is fun, or should be. I find birding an exercise in serendipity - one just never knows when something new, something unexpected, something catch-your-breath gorgeous will suddenly appear. That said, I begin with a post of a bird which, in the eyes of some, will put my status as a birder at risk - the Mallard. If the Mallard were a rare duck, we would fall over ourselves in finding ways to describe the handsome drake. But it is so common, easily tamed, and even self-domesticating, that it is typically ignored. The Mallard is a dabbler (which occasionally will dive), usually feeding in shallow waters on a wide variety of plants and small creatures. Drake Mallard "ice walking" - note also the "tail curls"
... or stretch precariously for a drink after squabbling after bread crumbs - handsome still, if a bit awkward. Back to the handsome drake. We may overlook him because he is so common, but the hen is swept off her feet (or wings?) by the dashing fellow. This one unable to contain her enthusiasm - hooray to you, you wonderful, manly, hunk of duck!! Love the post Chris and welcome on board BirdingIsFun! Fun post Chris! I love that shot of the duck on the ice. Common does not mean uninteresting! Thanks so much for this excellent post and for making us better appreciate a bird we mostly take for granted. Great post and great photos, Chris. Chris, wonderful, fun post filled with great images! 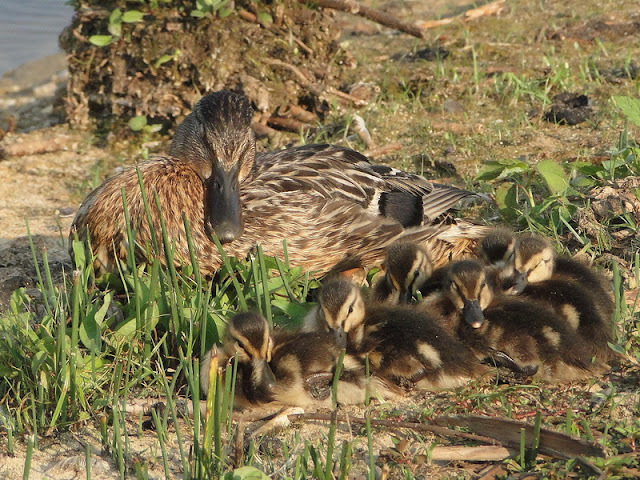 Love the tender moment captured with the mallard hen and her youngsters. The final image brought a big smile to my face. Thanks for sharing! Lovely post and sweet, sweet photos! We need to be reminded of every creature's inherent beauty, common or not, or a "looker" or not. Is there a Magpie post on the horizon perhaps...? Terrific post with wonderful images. I love mallards!! Great post! Watching a group of waterfowl and hearing a mallard announce to the world what a good time he is having always puts a smile on my face. Its hard to be in a "foul" (sorry) mood when you hear a mallard quack. Nice post and beautiful images of Mallards. As common as this duck is, it's quite the handsome beast.